SAGAMIHARA, KANAGAWA PREF. - Like most other American players, quarterback Devin Gardner and wide receiver Jeremy Gallon had no idea that football was even played there. 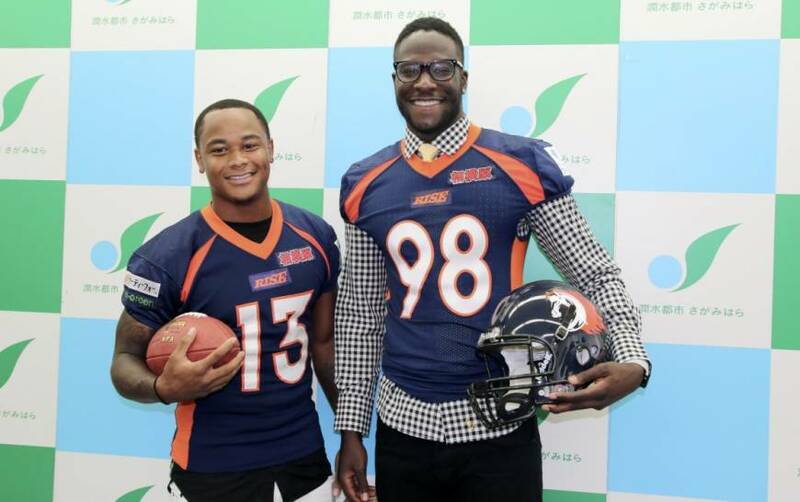 Now, the two former University of Michigan players will open up a new chapter of their football career “there” — in Japan. Gardner and Gallon, who have recently signed with the Nojima Sagamihara Rise of Japan’s semi-pro X League, are excited about their new challenge: a chance to play the game they love in a new environment on foreign soil. Gardner, 24, and Gallon, 26, played together at Michigan, one of the premier college football powerhouses in the United States, between 2010 and 2013. Gardner, a 193-cm signal caller, signed with the New England Patriots and Pittsburgh Steelers but wasn’t able to make their rosters for preseason training camps due to injuries. Gallon was selected by the Patriots in the seventh round of the 2014 NFL Draft. He came up short in his quest to make a team’s 53-man roster due to injuries as well. Gardner and Gallon both had huge games in the Wolverines’ 63-47 home win over Indiana University during the 2013 season. Gardner amassed 503 yards passing and 584 total yards, both school records, while Gallon racked up 369 yards receiving (two TDs) for a Big Ten Conference record. Though they both recently moved to Japan, they seem to already be cherishing their new circumstances. Football-wise, the two never thought the sport existed in Japan, but they were eventually surprised that the game is played so competitively here. They said that they’ve occasionally given their Japanese teammates some tips during practices, and were impressed at how they grasped things so quickly. Meanwhile, football’s popularity and the number of players between the U.S. and Japan are polar opposites. And Gardner and Gallon won’t be playing football before massive crowds like they did at Michigan Stadium — dubbed “the Big House” — the largest stadium in the U.S., which had a crowd of 115,109 for a 2013 game against Notre Dame. Gardner, who was a Michael Vick fan growing up, will put on No. 98 for the Rise. He inherited the number from a legendary former Wolverines halfback, Tom Harmon, who won the Heisman Trophy in 1940, in his junior and senior seasons. Likewise, Gallon, who stands 173 cm, will concentrate on what he does best no matter where he plays on the gridiron. “I push myself to the limit and bring some guys with me,” Gallon said. “I’m not the captain on the team. I’m here to learn and soak up every information. But this year, with my knowledge I’m trying to help someone else to better the team. I’m all for it, no matter if it is the Big House or not. In addition to the Michigan duo, Nojima Sagamihara has also signed ex-University of Illinois defensive back Earnest Thomas III. Rise head coach Takayuki Sunaga, a former quarterback, is confident and pleased that his team made its best-ever import acquisitions for the upcoming season. “We would like to make the team our best squad ever and win the championship this year,” said Sunaga, whose Rise made it to the final-four round in the playoffs in 2011, 2012 and 2015. Nojima Sagamihara fell 45-17 to the eventual X League champion Panasonic Impulse in the playoff semifinals last year. 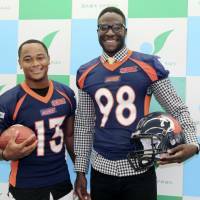 The Rise will kick off their 2016 season on Aug. 28 against the Obic Seagulls, who have acquired ex-UCLA quarterback Jerry Neuheisel this year, at Fujitsu Stadium Kawasaki.